Tipica casa centro storico, presso la stazione ferroviaria. Grande appartamento di 2.5 locali (80 m2). Colorato, accogliente, pratico, preciso. Con grande cucina e patio. Shopping, mare, natura, sport ed escursioni nelle immediate vicinanze. Wi-Fi e TV. La posizione, l'atmosfera, l'ambiente: Alpnach è natura allo stato puro. Molti ricreative e sportive rendono la regione unica. L'appartamento offre i seguenti camere e posti letto: 1 camera con letto matrimoniale e letto aggiunto. 1 soggiorno molto ampio con 2 divani letto. Il soggiorno può essere divisa in due stanze con un cellulare divisori in pochi secondi. La privacy è garantita. Adatto per un massimo di 7 persone. Viviamo nella stessa casa. E 'nostro piacere di aiutare i nostri ospiti con consigli e suggerimenti per escursioni nella regione - spesso legate a offerte e luoghi al di fuori degli itinerari turistici ufficiale. La nostra casa è integrato nel paese, ma non nel mezzo. Questo è il vantaggio. In cinque minuti siamo nella natura e l'acqua. Da casa si è in più di cinque minuti alla stazione o sulla strada. Arrivando con i mezzi pubblici: da Lucerna direttamente in treno fino alla stazione Alpnach-Dorf. Per chi arriva in auto: Da Lucerna Venendo A8 - uscita Alpnach Dorf - centro del paese direzione - girare a sinistra alla chiesa - proprio di fronte alla stazione ferroviaria. The location is very convenient, short train ride to Lucerne. However, the layout has the living area as the 2nd bedroom which is not very convenient for gathering space. Also bathroom is just outside the apartment door, weird but maybe a Europe thing. The appartment is exactly like descripted. So, if you don`t like the layout, why do you book it? In my experience in traveling the most important thing is the host, they are really nice and generous, they have some antique decorations which I like it, the kitchen is fully equipped. The train station is front of the building. Really I recommend for who looking for nice apartment between Luzern and Interlaken. Wonderful location, beautiful view, very close to train station. Amazing hosts and great communication. The property had everything we needed. We had a wonderful stay. The apartment was right across the railway station, so it was really convenient. Cozy little apartment with decent kitchen in a quiet and nice village. Ralph was a friendly and helpful host. Thank you!! Great apartment equipped with everything we needed for our stay in Lucerne! Ralph and Patricia’s apartment was perfect for our family of 7 people. 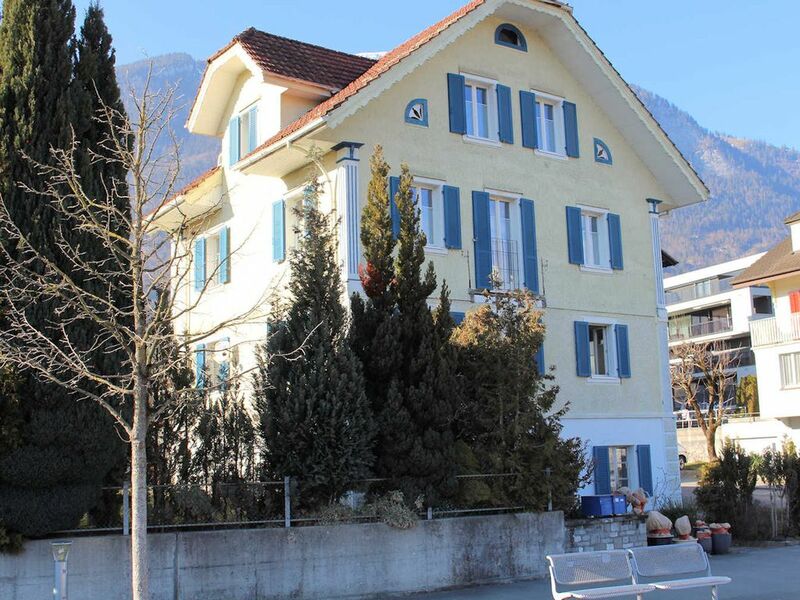 The apartment is located directly across the street from the Alpnach-Dorf train station, making it convenient to travel into Lucerne (20 minutes), Interlaken (90 minutes) and other surrounding areas. The apartment was fully equipped with everything we needed. Ralph and Patricia are wonderful hosts who went out of their way to accommodate us. They provided a beautiful apartment stocked with coffee, linens, toiletries, a hair dryer, a washer and dryer, and even a welcome basket which was filled with cookies and pasta. They even woke up and drove us to the train station in Lucerne at 4:30 in the morning so that we could make our early train out of Lucerne! Our family loved our stay in this fabulous apartment and are grateful to Ralph and Patricia for sharing their lovely home with us. Thanks for having been our guest. Anytime again. Host was extremely kind to attend our check out time as our flight was late in the evening.